Our hands represent the biggest source of infection, thus frequent hand wash and hand disinfection are mandatory measures to enhance hygiene and prevent infection transmission. The efficacy of alcohol-based hand disinfection to reduce the risk of bacteria and virus transmission is well-documented. 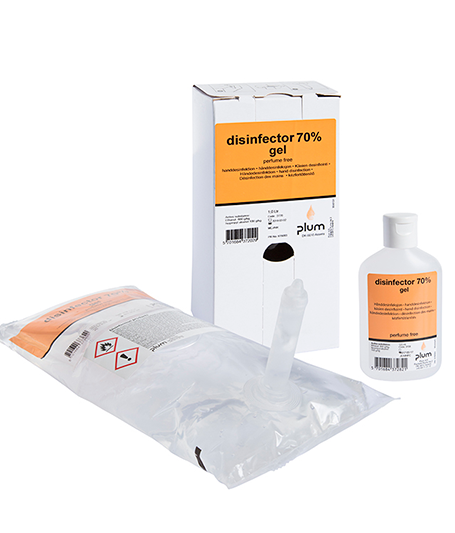 Ethanol-based disinfection gel (70 %) with lubricating properties for hand disinfection of bacteria. Well-suited for food processing staff, care staff in institutions, kindergartens, in public toilets and administrative buildings, industrial kitchens, restaurants and hotels and other areas subject to high hygiene standards.